VANCOUVER, British Columbia, Dec. 20, 2018 (GLOBE NEWSWIRE) -- Electra Meccanica Vehicles Corp. (NASDAQ: SOLO) (“Electra Meccanica” or the “Company”), a designer and manufacturer of electric vehicles, has provided a corporate update. The Company also released a video on the Zongshen factory in China, showcasing the production of the 2019 SOLO electric vehicle (EV), which can be accessed by clicking here. In 2018, Electra Meccanica produced over 40 manually-built vehicles at their first manufacturing facility in Vancouver, BC and delivered them to customers throughout the United States and Canada. These vehicles were delivered to paying customers and potential customers in efforts to conduct pilot tests for commercial use, as well as used for Global Compliance testing, such as crash tests. 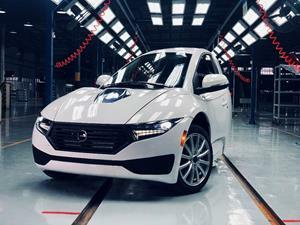 The Company revealed an image gallery of the first SOLO EV’s that were delivered to customers during 2018, which can be viewed at https://electrameccanica.com/gallery/. In October 2017, Electra Meccanica signed a manufacturing agreement with their strategic partner, Zongshen Industrial Group Co., Ltd, to produce mass quantities of the Company’s SOLO all-electric vehicle at their manufacturing factory based in Chongqing, China. This manufacturing facility recently shipped its first two 2019 SOLO EV’s to the the Company’s headquarters in Vancouver for on-road testing. An additional 48 SOLO EV’s are scheduled for shipment from the Zongshen factory to Los Angeles, Portland and Vancouver in the first quarter of 2019. A picture of one of the first SOLO EV’s produced at Electra Meccanica’s Zongshen factory in Chongqing, China can be seen below (Figure 1). An update video of the high-volume Zongshen factory can be accessed here, or by clicking the following link: https://electrameccanica.com/2019-solo. The video showcases the assembly of the 2019 SOLO EV’s, as well as testing, which includes a bumpy road test, charging test, three-wheel alignment test, sideslip and steering angle test, headlamp test, horn sound level test, speedometer and brake force test. Vehicle production and delivery from the Zongshen factory will ramp up throughout 2019 and the Company remains on track to commence deliveries of vehicles to customers. As of December 20, 2018, Electra Meccanica had a total of 64,154 vehicle pre-orders across all models, representing $2.4 billion in potential sales at the targeted MSRP. These pre-orders consist of 23,030 pre-orders for the SOLO single-passenger electric vehicle, which has a $15,500 target MSRP, and 41,124 pre-orders for the Tofino two-seat roadster sports car, which has a $50,000 target MSRP. All retail pre-orders require a refundable deposit totaling $250 for the SOLO and $1,000 for the Tofino. Dealer pre-orders require a letter of credit or letters of interest and all orders are non-binding. Reservations can be made at www.emvauto.com. Electra Meccanica (NASDAQ: SOLO) is a designer and manufacturer of electric vehicles. The Company builds the innovative, all-electric SOLO, a single passenger vehicle developed to revolutionize the way people commute, as well as the Tofino, an elegant high-performance two-seater electric roadster sports car. Both vehicles are tuned for the ultimate driving experience while making your commute more efficient, cost-effective and environmentally friendly. Intermeccanica, a subsidiary of Electra Meccanica, has successfully been building high-end specialty cars for 59 years. For more information, visit www.electrameccanica.com.